Conrad Puah Neo shuffles into the room with his father Clement, a cheerful smile on the younger man’s face. “Say hello,” his father tells him, and Conrad waves shyly. Over the next hour or so, he sits quietly by his father’s side, occasionally tugging at Clement’s sleeve and interrupting with a comment or two, and happily sipping his drink which he says is “very sweet”. Conrad is not a little boy. He is 43, and has an intellectual disability – the result of severe high fever when he was a year old. His parents Clement and Mona did not realise that the illness had exacted such a high price until, after Conrad had repeatedly missed developmental milestones, the doctor confirmed his condition when he was about four years old. The diagnosis left them devastated and helpless, initially. Conrad accompanied his parents to church, meetings, seminars and celebrations, and on overseas holidays. After his mum passed away in 2015, he continued the activities with his dad. Conrad is possibly more well-travelled than many people, having visited every continent except South America. To give him as normal an upbringing as possible, his parents sent Conrad to play school and kindergarten. When he was seven, he was accepted into APSN Katong School and later APSN Chao Yang School. At 16, he was transferred to the Movement for the Intellectually Disabled of Singapore (Minds) Towner Gardens School, and a couple of years later to Minds Idea Employment Development Centre (Minds IEDC), where he still spends his weekdays from 9am to 4.30pm preparing headphones for a major airline. To raise awareness on the importance of integrating persons with special needs into society, Clement has always ensured that Conrad is an active participant in social and community activities. Clement believes that all it takes is for society to be open-minded and unbiased to realise that individuals with special needs also have talents. One of the many contributions Conrad makes to society is to donate blood – he has done it 67 times. He was inspired by his dad who used to regularly donate blood. “He is such a regular donor that he is almost a celebrity,” says Clement. The former army man is his son’s sole caregiver. Energetic and sociable, Clement makes light of the challenges and responsibilities of looking after his child, whom he describes as “consistently inconsistent”. For instance, if he takes his eyes off Conrad for even a second, his son might just wander away. While he can recognise alphabets and numbers, Conrad can’t read. So it is a good thing that his survival instincts are strong. On more than one occasion, he has been separated from his dad in a crowded place, but he always finds a uniformed person to ask for assistance. 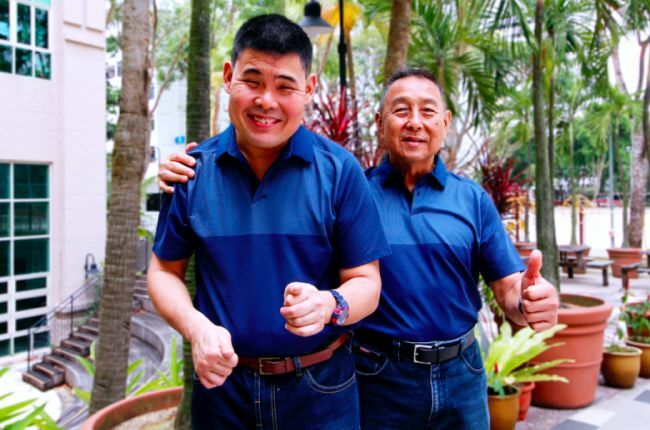 When we met, both father and son wore the same shirt design – a life hack Clement has adopted to ensure his son is more easily found should he stray away. A study by NCSS shows that caregivers of persons with disabilities experience caregiver strain, with four in 10 being psychologically distressed. Looking after a person with an intellectual disability can be exhausting, and caregivers need time to rest and recharge. Clement gets his “me time” when Conrad is at Minds IEDC. “More respite care is needed in Singapore – there are not enough professionally run care facilities,” says Clement, adding that “me time” should go beyond respite care – it should also be about enrichment. The Caregivers Pod at Enabling Village provides a dedicated space for caregivers of persons with disabilities to organise peer support sessions and get-togethers. Caregivers can also enjoy some rest time while their care recipients are engaged in activities at the Enabling Village. Clement also points to the facilities provided by Minds, which offers customised respite care, such as befrienders for care recipients when caregivers need to run errands. Should elderly caregivers need medical care, the special-needs individuals under their care can be admitted to Minds’ residential home for a stint. It is not just people with special needs who need help. Even caregivers need to be trained, through courses and working with professionals. Caregivers can tap on the Agency for Integrated Care's (AIC) Caregivers Training Grant (CTG) to offset course fees on topics such as behavioural management, functional skills development and caregiver self-care. Caregivers need to look after themselves. He makes sure he eats well and exercises every day so he will be able to look after Conrad. Clement has also begun to prepare Conrad for the future. Since Conrad went through a traumatic period when he lost his mother, Clement has arranged for his son to experience living away from home twice a week in a HDB-unit based facility run by Touch Community Services, where he shares a room with three others. On these visits, Clement tells Conrad he is going “camping”, but hopes that the adjustment period will prepare his son in the event he has to face life without his father, and reduce the trauma. He has also taken care of the legal requirements. Under the mental capacity act, when a person loses the capacity to think for himself, the caregiver must be appointed by the court, he explains. Unfortunately, not many parents are aware of this, he says. They also need help with the legal process. Clement was assisted by Minds and law students from the National University of Singapore to complete the process. He has named his other son Cedric to act on behalf of Conrad in the event that Clement is no longer around to do so. But the lingering wish at the back of his mind – and every caregiver’s, he says – is that “whoever we take care of should go before us”. Otherwise, “you feel you are unable to fulfil your responsibility”.